I have deep respect for ferns living in harsh conditions and one such fern is Asplenium obtusatum (Shore Spleenwort). This species is also present in New Zealand but the Tasmanian form is known as A. obtusatum subspecies northlandicum, a form that was described by the renown pteridoloist Pat Brownsey in 1977. 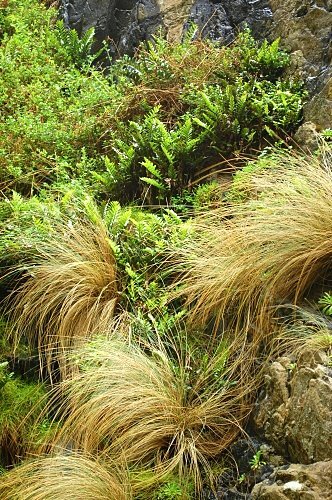 The Shore Spleenwort is allegedly common and grows on rocks along the coastline of Tasmania. Widespread as it is, I’ve only had the fortune of observing it growing on the cliff faces around the Remarkable Cave in the Tasman Peninsula and in the fernery of the Royal Tasmanian Botanical Gardens. The fleshy and shiny fronds of this fern makes it instantly recognizable and reminds me of the Sea Spleenwort (Asplenium marinum) of the Northern Hemisphere, a fern I would very much like to meet. Being ferns of such similar habitats, I imagine some convergent evolution in form is at work here. 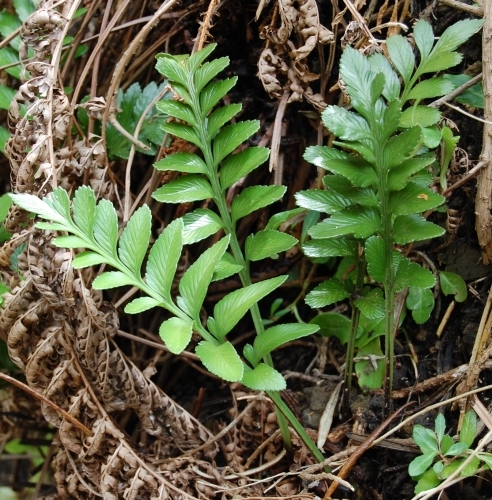 Asplenium obtusatum is tolerant of some salt spray, a remarkable feat indeed given the vulnerability of ferns during the earlier stage of their life cycle. This earlier stage are known as the gametophyte phase, as opposed to the sporophyte phase that we call ‘ferns’. The gametophyte is an inconspicuous little liverwort-like a structure that germinates and develops from fern spores. In most botany textbooks the fern gametophyte is portrayed as a heart-shaped structure and is called the prothallus. It is from the prothallus that the male and female reproductive parts develop. When the time is ripe for fertilization, the sperm swims through a film of water to find an ‘egg’ to fertilize. From this union, a baby fern is born, growing out of the tissues of the prothallus. The cycle is complete. 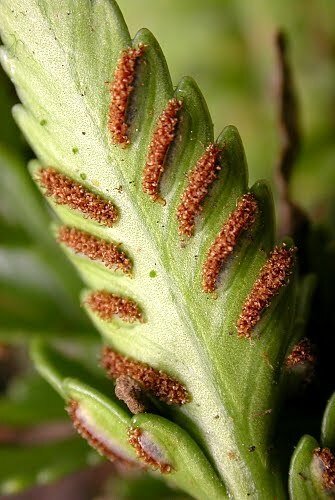 Unlike flowering plants, the fertilization of ferns require a film of water as mentioned above. Imagine the physiological stresses that a fern prothallus has to endure when the occasional salt spray comes into the picture! The Shore Spleenwort is indeed a hardy fern worthy of a lofty station by the magnificent cliffs of the Tasmania coast! This entry was posted in Botany, Common and Unappreciated, Ferns, Habitats and tagged Aspleniaceae, Asplenium obtsatum subsp. northlandicum, Asplenium obtusatum, fern life cycle, Pat Brownsey, Shore Spleenwort, spleenwort. Bookmark the permalink.